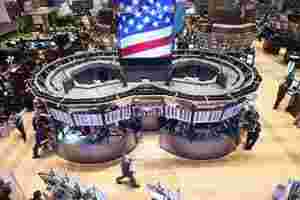 New York: US stocks closed a volatile, lightly traded session slightly higher on Monday, with sentiment continuing to shift with the latest headline from Europe. In a signal that investors remain cautious, the strongest performers were healthcare and telecommunications stocks, both considered defensive sectors. The S&P Health Care sector rose 1.2%, with Pfizer Inc gaining 2.1% to $20.07. Volatility in the stock market has become more closely correlated with shifts in European bond markets, another sign of Europe’s influence on US equities. “Given the overhang that Europe has been having on equities, stocks are going to be subject to intraday moves based on innuendo or conjecture as much as fact," said Mark Luschini, chief investment strategist at Janney Montgomery Scott in Philadelphia. “Any news that’s viewed positively is going to move the market, but I don’t trust the move. We could just as easily fall back down." The Dow Jones industrial average was up 85.22 points, or 0.71%, at 12,068.46. The Standard & Poor’s 500 Index was up 7.89 points, or 0.63%, at 1,261.12. The Nasdaq Composite Index was up 9.10 points, or 0.34%, at 2,695.25. The latest source of anxiety is Italy, where Prime Minister Silvio Berlusconi defied pressure to resign, keeping markets on edge before a key parliamentary vote on budget reforms. Volume was light, with about 6.3 billion shares traded on the New York Stock Exchange, the American Stock Exchange and Nasdaq, below last year’s daily average of 8.47 billion. Italian government bond yields rose to their highest since 1997 as political turmoil in Rome threatened to drag the euro zone’s third-largest economy deeper into the region’s debt crisis. “The big risk is that the Italian government doesn’t accept the austerity plan, which is Greece but on a scale a thousand times larger than Greece," said Jeff Buetow, chief investment officer at Innealta Capital in Austin, Texas. Buetow, who helps oversee about $3 billion in assets under management, said his firm had reduced equity exposure in recent weeks because of European uncertainties. “There’s a lot more downside risk than upside risk, and a lot of risk in general," he said. Adding to the uncertainty, Greece’s outgoing Socialist prime minister and conservative opposition leader raced to forge a coalition government and implement a new bailout program. Equities have been very sensitive to headlines from Europe, especially with a light US economic calendar this week and as earnings season winds down. The CBOE Volatility Index VIX fell 0.9% after rising earlier in the session. Fresh worries about sovereign debt default have boosted the stock market’s volatility. Priceline.com Inc sank 4.7% to $485.15 in extended trading after the company reported results below expectations. Consumer electronics chain Best Buy Co Inc lost 3.1% to $26.46 after the consumer electronics chain said it was buying British partner Carphone Warehouse Group Plc for $1.3 billion and scrapping plans for a chain of European megastores. On the NYSE, about 52% of stocks closed in positive territory, while on the Nasdaq, about 14 fell for every 11 that rose.